The role of the Chairman is non-political and can be held by any elected District Councillor from any party. To support and publicise the work of local community groups and volunteers throughout the district. To raise awareness for, and funds, for three local charities: Linda Jackson Macmillan Centre, Watford and Three Rivers Mencap and Three Rivers CAB. To actively listen to the Three Rivers business community through town centre walkabouts and other initiatives and act as a champion for local businesses. To build relationships with organisations and individuals in the community who are not currently working with the District Council. To visit, support and listen to local residents’ associations. To visit all 13 district Wards and the communities within them. To visit and actively listen to parts of the district which receive less publicity or which have fewer public amenities. To support the local environment including championing green and affordable transport. To support the interests of young people and the vulnerable including education, apprenticeships and back-to-work schemes. 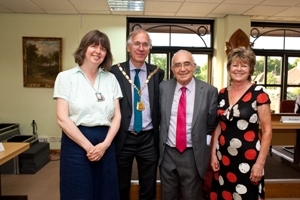 To hold a number of public events including charity fundraising events, a civic service and a reception to say thank you for the work undertaken by volunteers and community leaders in the district . To use my interest in sport to encourage the active use of local leisure facilities and open spaces . To help promote awareness of the Council’s and other local services – particularly among the young and the vulnerable. You can keep up to date by following this blog. I will also be posting on Twitter @threeriversdc and on the Council’s town Facebook pages.